Located on Strastnoy Boulevard, Dobro means goodness or kindness and there’s plenty of both at this gastropub, where the three owners – two former consultants and a chef - say the building was love at first sight. 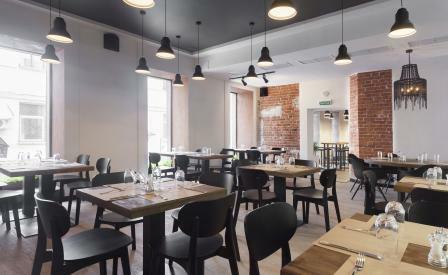 A stylishly simple and cosy interior of whitewashed walls and red brick are accented with native design details that include charcoal-hued chairs, warm wooden tables and chainmail lampshades. Food – also local – is seasonal and includes creative dishes such as cod and pea soup sprinkled with powdered pine needles. We suggest starting with the burrata from Vladikavkaz, washed down with a crazy cocktail such the Harviestoun Old Engine Oil served with vanilla ice cream.